In case anyone was on the edge of their seat, I have a wheat update! Last evening, after putting away the chickens, I thought I'd see just how ready the winter wheat was. I've checked on it periodically, and thought that it didn't seem as though it had even flowered and been pollinated yet. But I believe I have been mistaken, and that they are just rather small, not-so-swollen seeds. Our soil preparation for this project was dismal at best, so this is something to strive for in the future. I'd LIKE to see a chicken tractor prepare the space...hmmm, (mumbling to self, with a far-away look) add constructing a chicken tractor to the list. 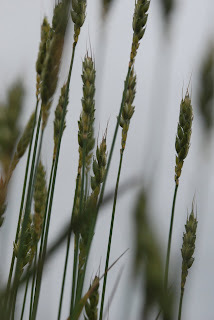 Anyway, the wheat is getting close to ready for harvest. We've had a spell of moist, drizzly, foggy, rainy weather all week. I suspect that when it changes, we will have hot and windy weather, which will dry the seed heads and all the grasses out in no time. Yellow hills are on the way. I've never done this before, so I'm not sure exactly when to do it. 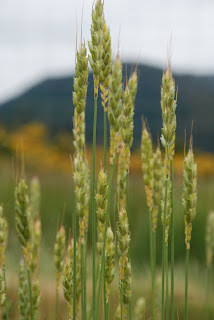 My reading suggests that you need to do it when it's partly dried out, but not too dry, otherwise the seeds will all fall off the stalks as you are moving it to your threshing area. It's gonna be an experiment. I do feel just a little proud that we did this, though I look forward to making it even better in years to come.